For airplanes using wheels: gravel bars, beaches, mountain tops (saddles and ridges) and, occasionally, roads. For airplanes using floats: rivers, lakes and coastal waters. For airplanes using wheel-skis (when in ski mode): glaciers and high-altitude snow fields. Large rocks. The most dangerous ones, because they are so hard to detect, are those just below the surface of the water. In some areas of the Northwest Territories such rocks will be your greatest environmental hazard. Floating debris. In the high Arctic this sometimes takes the form of oil barrels abandoned from exploration camps; along the Southwestern Coast of Alaska, expect to find logs and other trash from logging camps. Animals. These fellows can sometimes be difficult to see. Once, I almost hit a swimming bear with a Cessna 185. I got the distinct impression he felt I should have been watching where I was landing a bit more closely, and of course he was right. Boats. In populated areas this is sometimes a problem. Most Northern pilots consider the worst areas to be Southeastern Alaska near major towns (fishing boats) and the Matanuska Valley in Alaska (speed boats and water skiers following highly erratic tracks). Submerged sand and gravel bars as the water levels rise and fall. An additional problem (which could be considered one of terrain) is brought about by high winds on water. Floatplanes are designed to operate from sheltered water, and it is wise not to over-stress them. For many bush pilots, floats and skis are the preferred way to go, and a surprising number of the old-timers have managed to fly for years without logging any wheel-time. For the pilot of a wheelplane, gravel bars are by far the most favored landing areas in the North, and not a few of us would be well content if we could totally confine our operations to them so that, like the floatplane pilot, we never had to use commercial airports. This attitude comes from the calm freedom of gravel bar operations, combined with the often exhilarating sense of being remote from civilization, closely integrated with nature. Filling bars. This type of bar is far more interesting from a technical point of view, since it is formed by streams containing large amounts of glacial silt. (From the air these bars look like braided hair or a belt of woven leather.) During the summer, as temperatures rise and fall (often reaching well above 104 degrees F/40 degrees C in the direct rays of the sun), so too does the water level. As it rises it will cut a channel, then fill it partially and move over to cut a new one. This process is sometimes slow, sometimes fast, and can change on an hourly basis during extended hot spells after a winter of heavy snowfall. In these areas, finding a spot to land within reasonable walking distance of where your customers wish to go can sometimes be quite difficult. Often, a lengthy period of study from the air is required before an area (usually a short, narrow, twisting rocky channel) is located which will be adequate for a Super Cub. Examples in my main area of operations of this type of terrain are the Chitistone and Lakina Creeks. Length. The ability to judge accurately from the air whether a given landing area is long enough (when conditions are marginal) is a skill that becomes subconscious with time and experience. In Section II, various exercises are given which will assist you in developing this ability, but it is wise to take it slowly, for subconscious skills take time to develop.Starting with long smooth bars, using them regularly, one can, with time, slowly graduate to increasingly shorter and rougher strips, until knowledge and proficiency reach their peak. Texture. When an inexperienced pilot gets into trouble with an off-airport landing in the bush, it is usually not a matter of a bar's length so much as it is a matter of texture, or just plain unsuitability. Soft sand. This is easy to perceive. Waves on the surface usually are a sign that the bar is deep and soft. In this type of terrain you will get stopped quickly, and require a long takeoff run to get airborne again. Take care when using it not to apply your brakes very heavily, especially if attempting a short turn-off when there is still a fair amount of forward speed, for this could cause a tire to dig in and put the airplane on its nose. With its high-flotation tires and lighter weight, the Super Cub naturally does a better job than the Cessna 180/185, though as a general rule both work well if you touch down carefully and keep the ground-run straight so both tires dig in evenly. And, of course, a deep, soft sand pit can have its advantages. I have a nice little camp near a glacier in the Wrangell Mountains located on a small island where two streams meet, and the landing strip is a 350-foot gravel bar on the north side of the island. At the end of this strip is a line of trees and, due to their height and the approaches, the strip is a classic one-way strip: one must always land to the west and take off to the east. This would not be a problem for the Super Cub were it not for the prevailing wind. This wind pours off the glacier several miles to the south, hits the island, and boils around and over it, with half going down the runway following the general curve of the land until it meets the other half coming around from the other side of the island. The result: a turbulent 20 to 30 knot crossing tailwind when landing that often turns into a 20 to 30 knot crossing headwind just at the very end, and if I had three windsocks along the length of this strip they would frequently be pointing in wildly different directions. Fortunately, though, on one side of the island and roughly perpendicular to the main strip is a 150-foot patch of deep, soft sand. This patch of sand faces directly into the wind, and while the approach is wildly turbulent it is operative most of the time. This allows me to land into the wind on the sand patch, which then requires only a short taxi over passable gullies to the main strip where my tiedowns are located. When it is time to depart, I make my takeoff run down the main strip, holding the Super Cub on as long as possible, then lift into ground-effect and accelerate until I reach the end of the island and the main blast of the wind, which is now a direct crosswind. A tricky area, wind-wise, though all works out rather nicely due to the 350-foot gravel bar and a 150-foot sand pit. 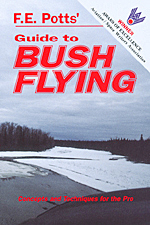 It is a classic bush pilot's answer to an interesting terrain problem. Rocks. A large percentage of gravel bars are made of material that varies in size from fine sand to rocks the size of a moose's head. As wind and water work on the terrain they will remove the small pieces, leaving behind the larger rocks. Usable ground will vary from reasonably textured sand and gravel with scattered large rocks to bars composed of rocks alone without the binding effects of sand (see illustrations 1, 1.1, 2, 2.1, 3, 4, 5, and 6). How large these rocks can be before the strip becomes too rough for an airplane depends on a number of factors, such as type of airplane, size of tires, current operating weight, wind velocity, and the pilot's willingness to risk damage. As a general rule, rocks over five inches in diameter not embedded in sand and gravel mark the upper boundary for routine Super Cub operations conducted with low-pressure high-flotation tires. Other types of airplanes and tires will require a corresponding reduction in rock size. Judging the size of rocks from the air is most easily done on sunny days early in the morning or late in the afternoon when sharply-defined shadows are cast. The best bush pilots become as subtly aware of light and its effects as the best nature photographers, and for much the same reasons. Gullies across a bar that prevent it from being used, no matter what technique is employed. These gullies are either too deep, too sharp-edged, too rocky, or in the wrong place (with reference to the airplane's speed when crossing them on landing or takeoff) to make the bar operational. Gullies across a bar that you can cross without risk during landing and takeoff if the proper technique is used. These gullies are generally shallow, and usually far enough from one end to make the strip operational (e.g., a bar 325-feet long with a diagonal gully across it at the 200-foot mark). Gullies you can land in. This type of gully is sometimes wide, sometimes narrow. The bottoms are, on occasion, smooth, though as a rule they tend to be rocky and eroded. Doglegs and "S" turns are common. Gully strips generally require a tailwheel airplane, usually a Super Cub on tundra tires. Driftwood. Driftwood is often found on gravel bars and must be watched for, especially on bars covered by fireweed. A marginal strip can sometimes be considerably improved if you are willing to take the trouble to land lightly loaded on a day with a bit of wind, and go to work with ax and shovel. Tracks in the sand. It is quite common when flying in areas of extensive gravel bars, or other forms of suitable terrain, to discover airplane tracks on almost any flat surface. This leads to the assumption -- especially among Super Cub pilots -- that if somebody else landed there the strip must be okay. Unfortunately, this assumption has been proven incorrect so many times over the years that it has now become a classic cause of off-airport accidents, and, while the NTSB prefers to relegate the cause to the catchall "Pilot Error" in its accident reports, the reality of the trap that plays "gotcha" with so many inexperienced pilots cannot be denied. The natural action of the water as it rises and falls can remove a portion of a once-adequate strip while leaving tire marks on the inadequate part that remains. The inadvertent repetition of somebody else's mistake can lure the unsuspecting pilot. Here you have the situation of somebody landing on a gravel bar that was too short or rough, wrecking their airplane, then having it helicoptered out. Left behind are the tire tracks, much like bait for other incautious pilots, tempting them to try and land. The skillful actions of an experienced and competent pro who has landed where it is almost impossible except under certain carefully defined conditions of temperature and wind in a lightly loaded Super Cub. Later these conditions change (the wind shifts or drops, the temperature rises, etc. ), and the strip becomes inoperable once again for even the best of us. It is wise to avoid primrose paths, understanding that just because there are tracks in the sand does not mean that the strip is suitable for landing. Gentle fields of purple flowers. Alongside the rivers and gravel bars you sometimes find lush fields of fireweed and other flowers, often ringed by cottonwood and willow. These fields, with vegetation that can easily grow higher than your wheels (see illustrations 11 and 12), often make fine landing areas. Beneath them is dry, well-drained gravel, much like the terrain that lies around them. However, these beautiful flowers may provide camouflage for the same problems most gravel bars share: large rocks, gullies, and driftwood. Because of this, you have to be quite careful when using a new field whose surface is not well known. It is often wiser to land someplace else (even if it is a few miles away) and hike in for a firsthand look, rather than take the risk of damage to your airplane. My experience with mud flats (and their propensity to cover a clean, well-maintained airplane with mud) has been happily limited, for they are quite rare in my area of operations. However, in other parts of the North, especially along the coast, you will frequently encounter this type of terrain. The flats near Anchorage, in fact, are quite popular with duck hunters (as well as airplane repair shops). Mud flats are obvious from the air and, depending on area and condition, can sometimes be successfully landed on with tundra tires (for this job, the 30" tires work best). There is, however, a bit of risk in trying to use truly marginal mud flats, for you could flip your airplane onto its back. As a result, it is usually preferable (as Mudhole Smith, who started Alaska Airlines years ago, would sadly have told us) to use a floatplane under such conditions. Mud flats do not present any problems for a wheelplane when frozen, of course, and during spring and fall when night temperatures drop below freezing these strips are operational during the early hours of the morning. There are many beaches along the coast that provide good landing areas. The same considerations apply to them as apply to gravel bars. Since beaches generally have a fair slope to them, be prepared for the plane to want to head for the sea on both landing and takeoff (a little upslope rudder generally manages to take care of that problem nicely). "Look at that nice grass-covered meadow..."
The newcomer ("Cheechako" in the vernacular) to Alaska and Northern Canada is often amazed, during his flights across this vast landscape, by all the pretty meadows scattered among the trees. Every once in a while one of them will land on the grass, only to discover that the grass is, in reality, a bog (muskeg). These bogs can be counted on to either take the gear off one's airplane, or flip the plane over onto its back. If the damage is not too severe and field repairs are possible, you can fit the airplane with skis and wait for winter and enough snow to fly it out. If the damage is too severe for field repairs, a helicopter can be hired to haul the airplane out. Naturally, under these conditions, it will have to be partially disassembled. There are many definitions as to when, and how, a newcomer can lose his or her Cheechako status; perhaps landing in a bog is sufficiently educational to qualify as one of them. It is surely expensive enough. Optical illusions. The tilt of a strip, whether it is level, slopes to the side, or goes up or down, can sometimes be quite difficult to determine. Wind. Like certain gravel bars, mountain landing areas require that the pilot carefully pick his operating conditions. This is not only due to mechanical and convection turbulence, but to the fact that most of the strips are one-way. As a general rule, the best times to operate from mountain strips are early in the morning and late in the afternoon, with early morning preferred by most pilots. The engine will not develop full takeoff power (assuming the usual non-turbocharged Super Cub is being used, as is almost invariably the case with wheel mountain landings). The airfoils will not be as effective. As a result, not only will your landing and takeoff groundspeed -- though not your IAS -- be higher than what you are accustomed to, but on takeoff your engine will not be producing full power and your prop will not be as efficient. This means you will need a longer than normal ground run for both landing and takeoff. Watch your loads. Few of these strips allow gross-weight operations; this is especially important on takeoff. Select landing areas carefully. When the choice presents itself, select an uphill slope. This slope not only helps you to stop within a reasonable distance, but, more importantly, assists you during takeoff where the thin air and lack of power are felt most strongly. Tires. Due to altitude and its effects on tire pressure (particularly the low-pressure, high-flotation tires used on Super Cubs), you will usually want to deflate your tires about 20% prior to leaving your low-altitude base camp for your high-altitude spike camp. This enables you to have your tires at the proper inflation for using the rough terrain in the mountains, even though additional care must be taken when using your brakes at the low altitude strip least you turn a tire on its rim. A lower elevation strip within hiking distance of your high camp. The snow shovel exercise (you can cheerfully airdrop a few to your hunters). This is hardly as bad as it seems, since it does not take all that much effort for a crew of men to clear an area the width of your wheels and about 500 feet in length (the usual size of a mountain strip used by a Super Cub). Exercising patience. This actually works surprisingly well during early fall, since the first few snowfalls rapidly melt off and the wait rarely lasts more than three or four days. For as long as aviation has been established in the North, roads have been used as airstrips, and there are still many villages whose main street serves as their official airport. It has long been the practice in remote rural areas for those who live alongside roads to use them as landing strips, then park their airplanes in their yards. However, now that the North is developing, this practice is becoming just a memory, for road operations are frowned on by new settlers in most areas. Still, along the Alaska Highway (which is used as a VFR flyway from Fort St. John to Anchorage and Fairbanks), numerous stretches of the road are suitable for emergency use, and I, along with other pilots, have found occasion over the years to use one stretch or another for this purpose. At present, there is no law (of which I am aware) prohibiting road landings in Alaska or Northern Canada, though a general trend is moving in that direction. I would suggest you use roads as little as possible, and, who knows, maybe the politicos will never get around to outlawing their use (out of sight, out of mind, mode).